Warehouse management isn’t just about storage anymore. 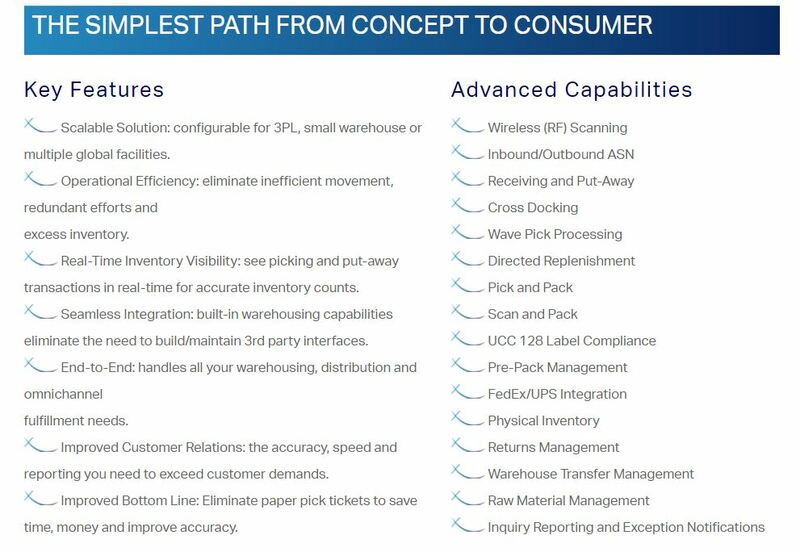 In today’s omnichannel business environment, complex fulfillment strategies and disruptions to the movement of inventory are commonplace. 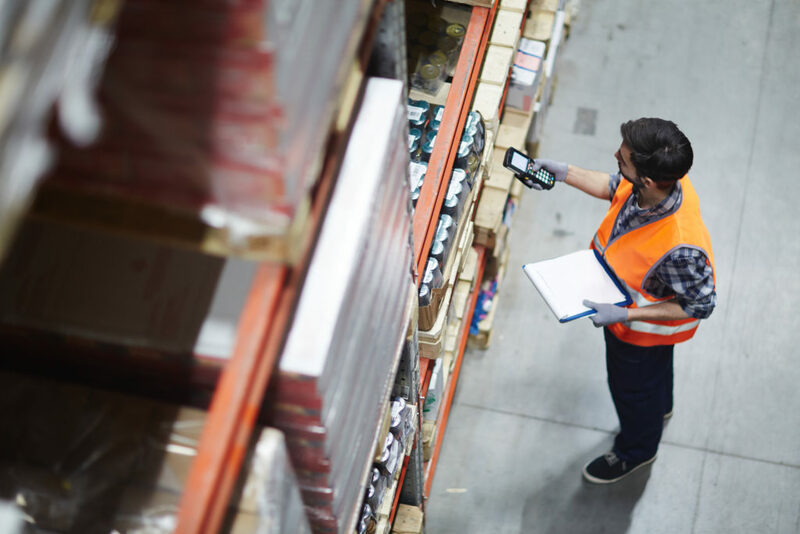 How your warehouse management solution handles these challenges and ensures delivery of the right products to the right place and time is what differentiates one system from the next. 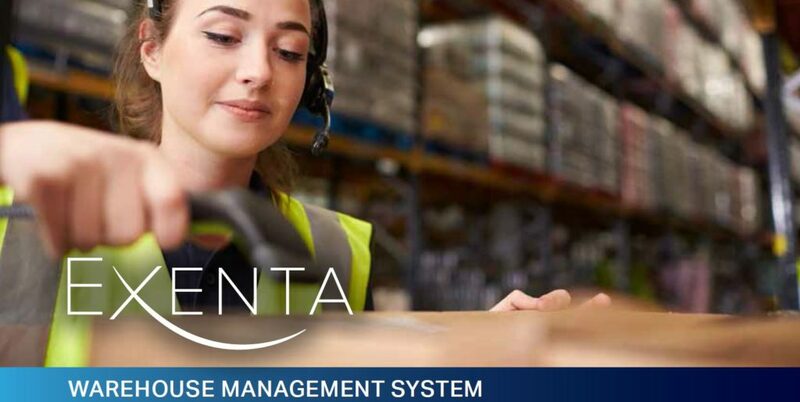 Exenta® WMS (Warehouse Management System) empowers you with the visibility, agility and control you need to operate more efficiently across all supply chain processes and every sales channel. It delivers the solutions needed to speed operations, reduce inventory levels, increase productivity, ensure accuracy, and improve customer relationships. As consumers demand ever faster and more innovative products, fashion and soft goods brands and retailers are challenged to evolve with the times. To remain competitive in these fast-paced and competitive markets, companies need to find better ways to grow revenue while reducing costs. With no time to waste on complex and cumbersome systems, it’s time to take a fresh look at PLM. Representing the latest evolution in PLM, Exenta™ PLM REVO™ has the power to turbocharge your product lifecycle. 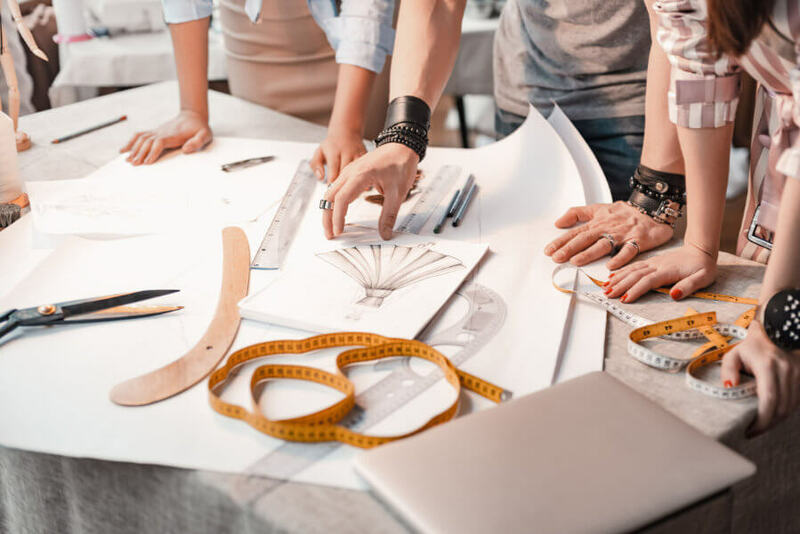 Taking the user experience to a whole new level, it eliminates much of the tedious data entry to keep designers creative and automates time-consuming processes to speed products to market and simplify global collaboration. The companion Exenta PLM REVO™ Design Plug-in for Adobe® Illustrator® enables designers to launch new concepts, contribute to and use information from PLM without ever leaving their design software. 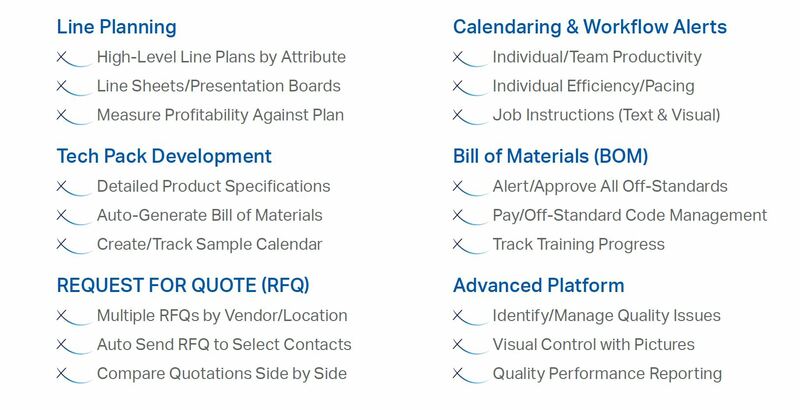 The web-based/cloud/mobile solution streamlines approvals, change management, line selection, vendor quotes and bids, compliance and other global processes. Real-time information and analytics keep everyone working on the same page and supports better-informed and more timely business decisions. Whether Considering Your First System or an Upgrade from Your Legacy PLM, a Standalone or Enterprise-Integrated Solution, We Invite You to Discover The Evolution of PLM. 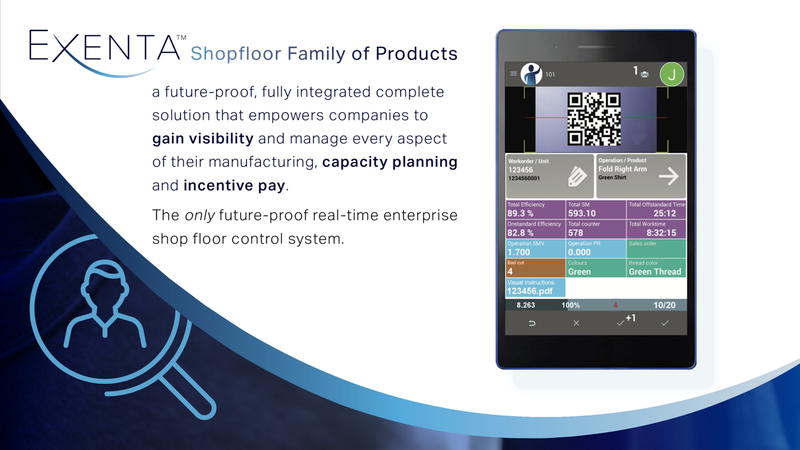 Exenta Shopfloor is easy to setup, implement and use technology that tracks and manages shop floor activity and productivity in real-time. 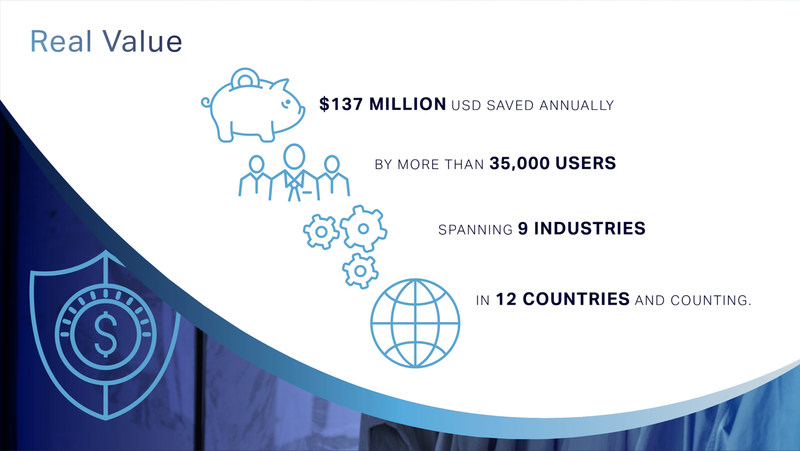 It serves as a remarkable solution for end-to-end production and supply chain planning, continuous improvement, and incentive payroll processing. It provides always-on visibility throughout the cutting, sewing, finishing and packaging production operations. Many companies have documented ROI on their Exenta Shopfloor investment within three to six months. 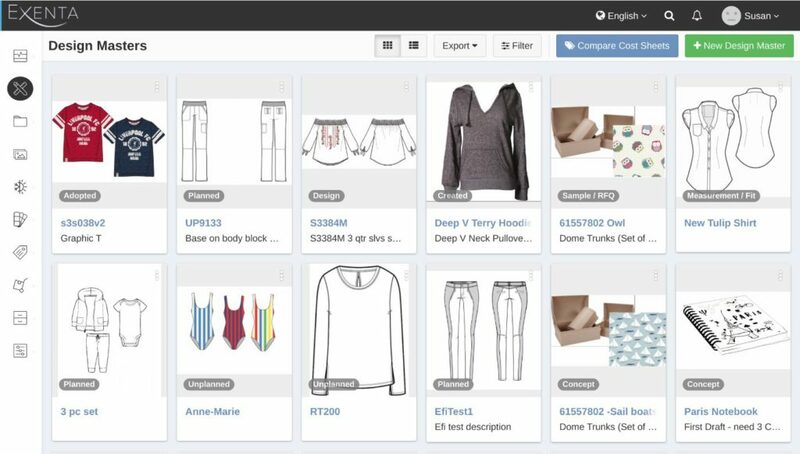 Exenta, the leading technology innovator in the fashion and consumer goods industries, recently added Shop Floor Control to its suite of ERP, PLM, MRP, SCM, WMS, Integrated Financials and EDI solutions. 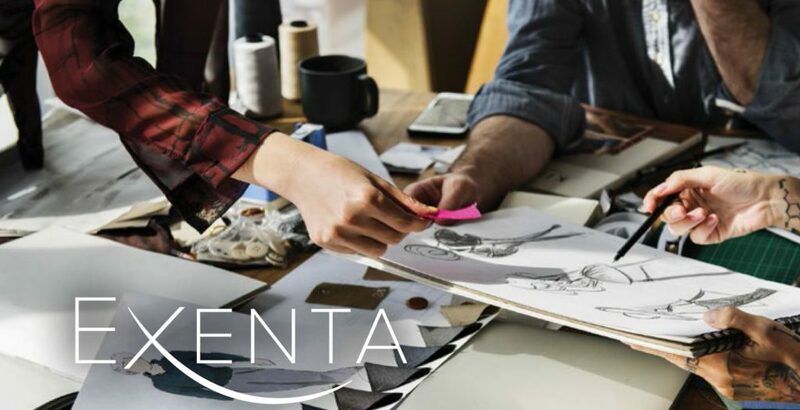 This combination of integrated products sets Exenta apart as a developer of complete end-to-end solutions for fashion and related brands and vertical retailers. Enhanced by the company’s global resources and over 150 years of combined experience in leading edge technologies, Exenta Shopfloor is the leader in shop floor innovation. The product’s flexibility and adaptability will continue to deliver ever-increasing bottom line results to its ever-expanding international customer base. Exenta Shopfloor is advanced technology that is easy to deploy and integrate with established systems, use and maintain. The primary shop floor hardware consists of affordable wireless Android tablets loaded with an easy-to-use app and intuitive interface. Machine operators and other production workers get real-time feedback on their own productivity in real time via their wireless tablets. Production and plant managers are able to observe productivity in real-time to identify quality issues and prevent production bottlenecks from escalating into significant delays. The system also calculates incentive or hourly gross payroll. Setup and training is achieved in just days due to the intuitive application. Exenta Shopfloor boasts more than 35,000 users installed, making it a broad production-proven solution that is well documented to improve shop floor efficiency and boost productivity. 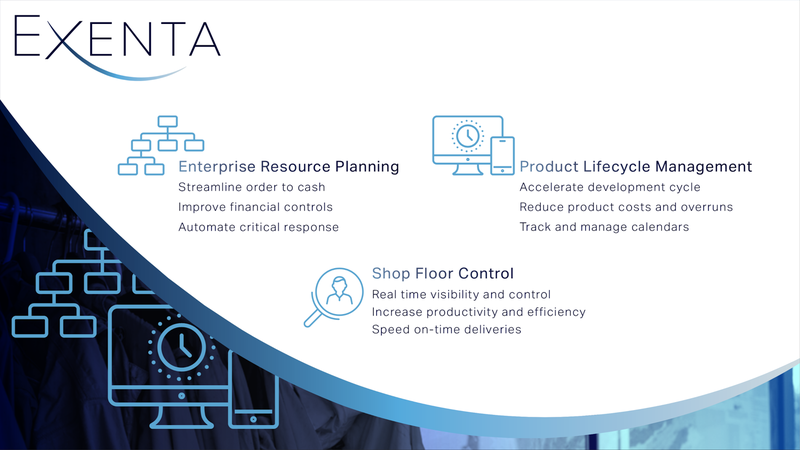 Since its original release, Exenta Shopfloor developers have had one goal in mind; to deliver measurable improvements and results for its customers. Working with beta testers and then live customers, user and management feedback has guided all innovation and development. Can setup speed be improved? Is the application as user friendly as it can truly be? Are managers getting all of the information they need to make the most cost and time-effective manufacturing decisions? Are production workers incentivized to work faster and more efficiently at once? How can defect rates be lowered? These were the types of guiding questions which were asked. In each case, improvements were and are continuously made based on real feedback and data provided by both the manufacturing workforce and production managers. The results are impressive and well documented. Exenta Shopfloor has proven and consistently reports increases in productivity and efficiency of up to 37%. 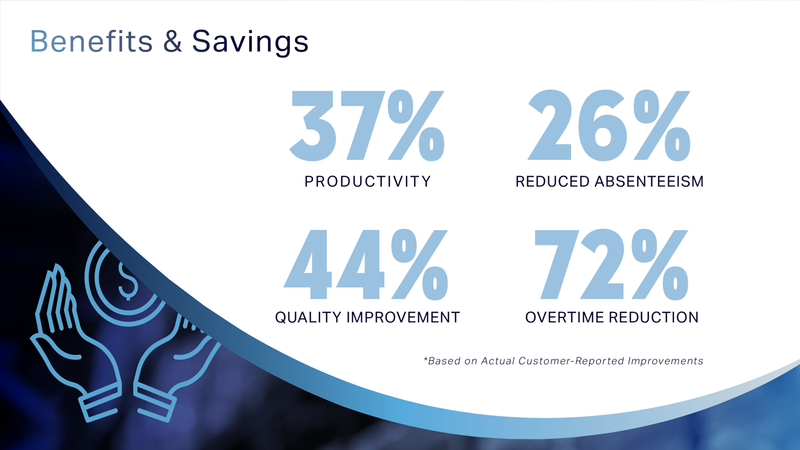 It drives substantial reductions in absenteeism and increases in quality throughout the supply chain. The system also eliminates the need for paper and gum sheets while drastically reducing labor hours required to calculate and manage payroll. This move from gum sheets to wireless tablets and real-time data collection means no longer being lost in stacks of papers and reports and payroll inconsistency. Throughout the shop floor and supply chain errors, redundancy and confusion are drastically reduced. Exenta’s shop floor control solution has enabled many companies to completely modernize their manufacturing operations and drastically decrease downtime. Exenta Shopfloor is an off-the shelf product that is so quick and easy to install it enables deployment without any significant disruption to production operations. It can be implemented within minutes per workstation. Most importantly, the return on investment (ROI), taken as a whole, is often proven within three to six months. Exenta Shopfloor also provides real-time management control and visibility through a browser based application that can be accessed from any web-enabled device. It is available in most languages, which adds to its global appeal. It can be integrated and utilized by multiple international companies, divisions or partners which all access the same secure portal. Some key management features include quality control and labor metrics, report generation, instant email notifications and alerts, and even the ability to download information into worksheets for purposes of doing cost accounting with real time data. User training with the shop floor management tools is easy and fast. The features and functions are as intuitive and as familiar as any other mainstream application in use. You’re probably hearing more and more about Omnichannel marketing as the newest and best way to serve today’s customer. But what exactly is it, and what is involved in incorporating it into your business? Retailers today must be able to serve customers in the manner of their choosing—not their own. That means focusing on all aspects of your business and how they interact with your customer. An ecommerce solution, or a brick and mortar solution in isolation, no longer works. Everything must be seamlessly integrated. One of the best ways to ensure the best possible shopping experience for your customer starts with a program involving data gathering and analytics. Done correctly, it will give you an eye-opening look into what exactly your customers are doing. This, in turn, can both help you better tailor your products and the methods by which your customer purchases and receives those products. The data may be difficult to collect and properly integrate, but once it has been reviewed and stored, it can provide extremely valuable information. While one customer may prefer shopping on their mobile device, another may prefer using their laptop or even making a trip to the physical store. As a result, a business needs to ensure that all three shopping experiences will be the same across the board – customers enjoy stability, ease of use and accessibility. It’s extremely important to provide that type of experience, no matter what platform they are using. Of course, Omnichannel marketing isn’t just restricted to the technological aspect of things, as clients may be using methods such as magazines or word of mouth to engage with your business. So how exactly can a company best accommodate all of these different ways to engage with a brand? Omnichannel marketing is increasingly becoming the answer for most businesses. The most important thing to remember is that your customer is at the center of any Omnichanel marketing strategy. By doing so you are ensuring that your customer is receiving the best experience possible when engaging with your brand. Context is key. Marketers must know when and where to communicate information relevant to a customer’s purchase decision. It is clear that the industry’s changing landscape has incentivized retailers to update customer engagement strategies. Omnichannel marketing has emerged as the best way today to ensure a smoothly integrated brand experience across all communication delivery channels. Keep your customer at the forefront of this strategy and you will emerge one of the big winners in the marketplace.